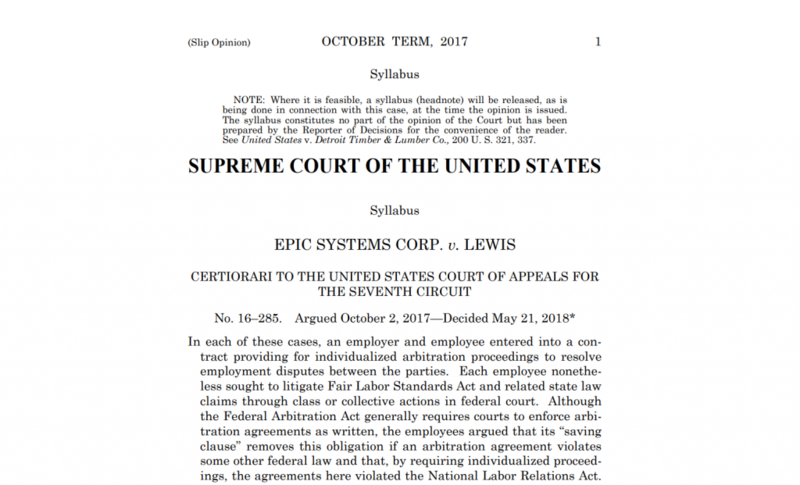 In a 5-4 decision, Justice Gorsuch’s majority opinion ruled that employees’ rights to participate in concerted activities under the National Labor Relations Act (NLRA) does not include the right to participation in class and collective actions. The Federal Arbitration Act (FAA) beat the NLRA. Unfortunately, the Supreme Court’s views about arbitration (and interpretation of the word “agreement”) in consumer and employment contexts are no longer the relative surprise they were in 2011. The Supreme Court has not changed, in this sense, but the world around it has: as just two examples, the #metoo movement and empirical studies of the infirmities with pay secrecy show that silencing and silo-ing employees creates various kinds of inequality and other problems. We, as employee-side lawyers, will have to take these and other examples and push forward until there is a legislative fix at the federal level, or even if there won’t be a legislative fix. First, just as localities and states have been enacting legislation on pay secrecy and use of past salary in setting compensation (reforms that are linked to the idea that hiding information hurts employees, not employers), we need to look to our local governments on this issue as well, not only from the specific (and maybe limited) prism of how to counter arbitration, but how to help workers. Second, to the extent that there is growing understanding that there are negative consequences to silencing women (and men) who are victims of sexual assault—people who also “agree” (as in, don’t really agree) to silence—we have to keep reminding everyone who will listen that forced, confidential arbitration does the same thing. Bad employers don’t get the reputational hit of misconduct. Good employers don’t get the benefit. And all employees suffer this way. Third, we’ve said this before (e.g., discussions of mass consumer action) and we will say it again and again: employee-side lawyers will not stop pushing to help employees who are underpaid and otherwise harmed. We will do class action cases where we can—and there are still many contexts in which we can—and we will do individual cases, and we will do arbitration. Fourth, we will look for new ideas, new allies, and new thinkers, including students and educators. Law schools are now asking employers about arbitration agreements. Perhaps colleges and business schools should be next. We have no desire to spin: the opinion is bad, a blow, an embarrassment that reflects the palpable inequality of our time. But it’s not a surprise. And we will keep litigating.